The Department of Primary Industries and Regional Development (DPIRD) are investing staff time and funds into controlling Mediterranean fruit fly (Medfly) in Carnarvon through an eradication pilot project, while the Carnarvon Growers Association Recognised Biosecurity Group (CGA RBG) have issued a Declared Pest Rate to landholders in the Carnarvon horticultural area to raise funds for the control of Medfly. This page provides answers to Frequently Asked Questions (FAQs) regarding the roles of DPIRD and the CGA, the control of Medfly in Carnarvon and the Declared Pest Rate. Q. How will Medfly be eradicated from Carnarvon? A. DPIRD's Carnarvon Medfly eradication pilot project uses a combination of Sterile Insect Technology (SIT), area-wide foliar baiting, crop hygiene and facilitated community engagement to help eradicate Medfly from Carnarvon. Q. What is SIT and will I be able to tell the difference between sterile and wild Medflies? Q. How can I help eradicate Medfly? A. Community involvement is critical to successful pest eradication. In addition to making your friends and family aware of the threats posed by Medfly, ensure you are using control methods appropriate for either residential[ABC1] or commercial properties[ABC2] . 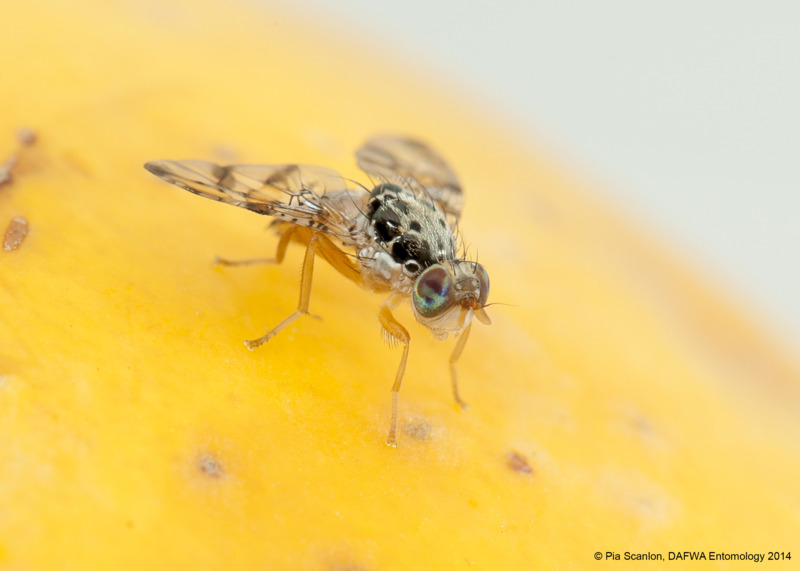 Q. I only have a few fruit trees in my backyard; do I need to worry about Medfly control? A. Yes, community assistance to control Medfly in backyards is crucial to the eradication project. Just one piece of fruit can hold up to 300 eggs so it is essential to always use control methods appropriate for either residential or commercial properties. Q. Will the baiting and fly release activities damage my crops? A. No. Baiting activities are modified for certain crops, such as mangoes, so that damage does not occur. The release of only sterile male flies means that there is no piercing of fruits by these beneficial insects. Q. I don’t want to kill the sterile Medflies, should I stop baiting and trapping for Medfly when the sterile Medflies are released? A. No. The release of sterile male fruit flies and foliar baiting are compatible and there is no adverse effect in baiting immediately before or after the release of sterile flies. Q. Will the baiting activities attract fruit flies to my crops and increase the number of fruit that is damaged? A. No, Medflies do not generally fly far from their place of emergence. Any newly emerged flies will be attracted to the protein bait in their immediate vicinity. Q. Why am I being charged a Declared Pest Rate? A. This Declared Pest Rate funds the upkeep of the CGA RBG Medfly baiting program, which includes employment of three full time baiters. Each dollar raised will be matched dollar for dollar by the State government. Q. Does this mean that growers no longer need to control medfly on their properties? A. 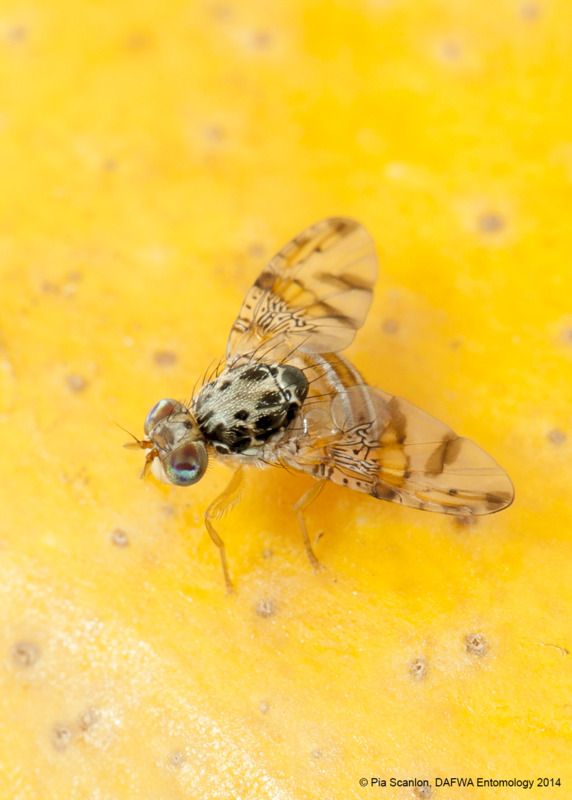 No, growers must control Medfly within their orchards. If property owners do not implement control measures, such as foliar baiting and good crop hygiene, compliance activities will take place. Q. I have been told that if ‘too many’ flies are found in a trap on my property, I will be subject to compliance action. How many is too many? A. ‘Too many’ flies refers to the number of wild flies (not sterile flies) in the trap being significantly higher than the number found on other traps at the same time. If there are too many wild flies in a trap, the compliance inspector will visit all the properties surrounding the trap and assess if effective control measures are being taken. If it is found that effective control measures are not being taken they will issue a Pest Control Notice providing specific directions on what you need to do. Q. Will I pay for Medfly inspections? A. The initial inspection, where the inspector comes to assess whether you are carrying out effective control, is not charged. If the inspector has to come back and follow up on a Notice, you will be charged. Q. Why will I pay for compliance inspections if I pay my rates to the CGA RBG? A. CGA RBG funds are used to pay for baiting and sterile insects. If you carry out appropriate control on your property, you will not be subject to compliance inspections.